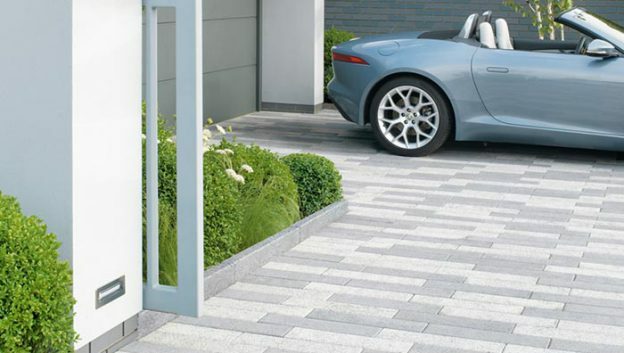 Your front garden is a place for you to enjoy, yet sometimes it can simply feel like the driveway – a few potted plants and a place for your car feeling like the only option. Is yours waiting to be transformed into a place you want to be? Here’s four steps to work through with your garden designer to create a space that’s practical and attractive. First, think about what you really need in your front garden. Is it space to park your car, disguise your wheelie bins, or cultivate a few vegetables? By working out what you need, your garden designer can establish what will effectively fit into your space. For example, you need to allow a 10ft width for a parked car with enough room to open the doors and get out easily, while herbs and flowers can be grown in even the smallest of spaces. Be honest with your designer as to how much time you’re willing to devote to looking after your garden too. You might have to rethink your dreams of perfectly-clipped topiary if you’ve only got half-an-hour a week spare. Certain hardy and robust planting requires very little attention, while others need regular TLC. Just because you need to include a driveway or paved area in your front garden doesn’t mean you should compromise on aesthetics. Choosing attractive, well-designed surface products can change the look of your front garden while still making it functional. Speak to your garden designer about whether you want to be sympathetic to the style and era of your house, or if you had a complete contrast in mind. 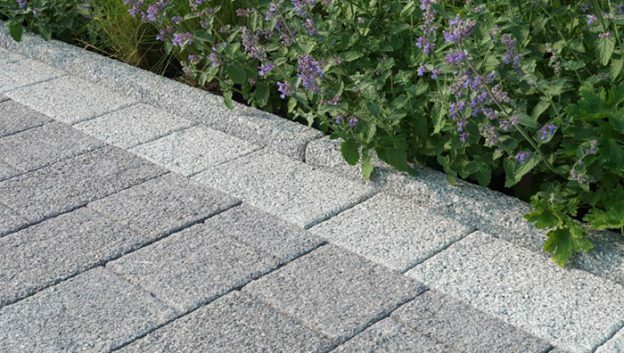 These Vecta linear setts are particularly well-suited to modern houses – they come in four elegant colourways which can be mixed and matched, and are lightly ‘washed’ to show off their texture. 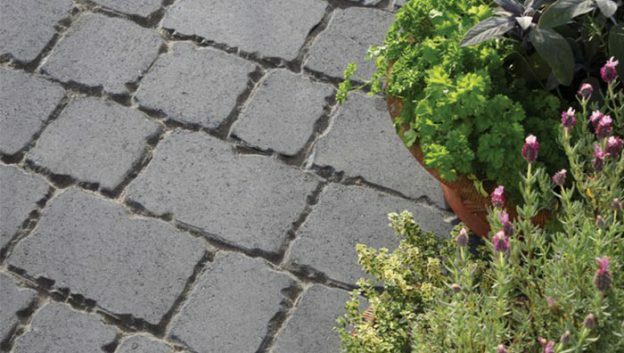 If you own an older house, our Trustone paviors are ideal, with an antiqued finish and mixture of sizes for a traditional look. Planting, edgings, and coordinating walling can be used in your front garden to establish different ‘areas’ – just like you would do in a larger green space or your back garden. Tell your designer if you want more privacy, so they can suggest ideal hedges or small trees for the border to the road to help reduce noise and, when mature, add extra seclusion to your space. It’s important to consider how your front garden will look all year round, so ask your designer about shrubs, trees and planting which will be as attractive in December as they are in the height of summer. Fruit trees are pretty and functional, or you could go for more exotic choices like hardy palm trees. Think about the colours you might like to look out on from your front room – do you want to be calmed by blues and purples, or energised with pinks and oranges? In Britain, we normally spend our time tucked away in our back garden when summer comes – but why not make the most of the beautiful space you’ve created and enjoy your front garden? Sitting outside the front of your house, watching the world go by and waving hello to the neighbours is something our European cousins do very well. Garden furniture – a comfortable bench or a couple of chairs – gives you a space to rest and relax. 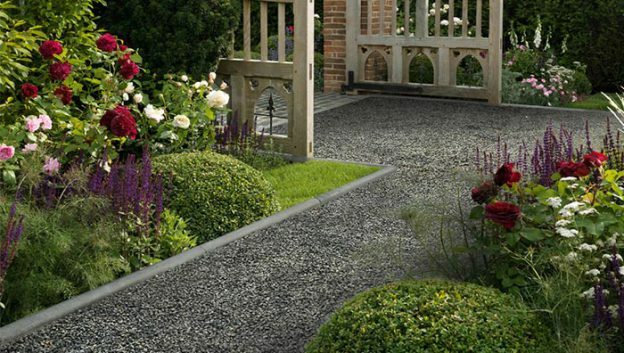 With the right planting, you’ll have a bit of privacy, and with the right paving, enough space for your car to be parked securely without it taking over the whole garden. Function and beauty go hand in hand. Something that’s well-designed and considered is much more attractive than something that’s been thrown together. Using an expert designer to help you plan your front garden carefully, you can have the best of both worlds – a practical space you love spending time in.